Aluminium case, plastic cones, barrier tape, foldable chair etc. Urban space occupation kit is a sculptural/performative work examining authority and control over public space. It serves as a medium for observing, interfering and researching the public space in relation to personal space. It draws attention to the functions of shared environments and the way they are governed in different cultures. The physical part of the work is a package containing red-yellow plastic cones, a foldable chair barrier tape and a yellow attention vest. All this is neatly packed in an aluminium case. The package functions as a medium for performances in public space. 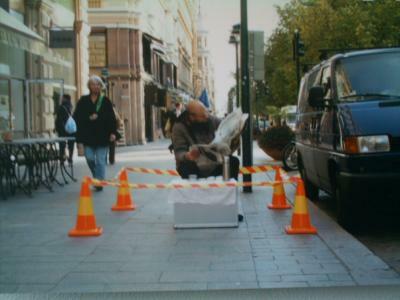 By utilising the equipment provided, the user of the package occupies a territory for him/herself in the middle of public space. This occupied space can then be used for desired personal purposes (reading, praying, singing, yoga, or what ever).